To review this book, I borrowed it from my local public library. 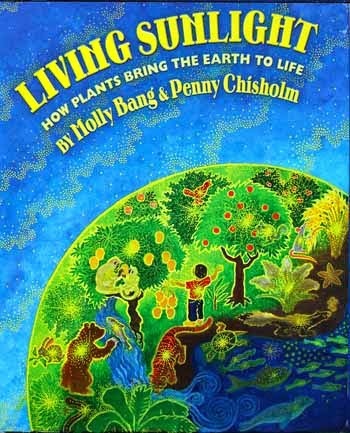 Author-illustrator Molly Bang has now written four books about the sun’s life-sustaining role in our world. 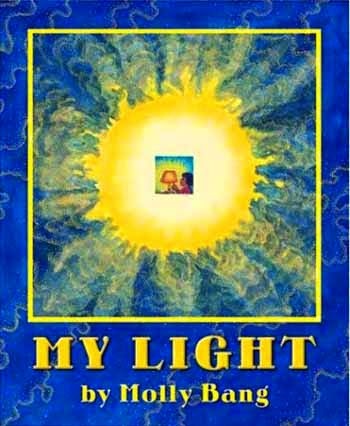 She began with My Light that explained the sun’s role in creating electricity. 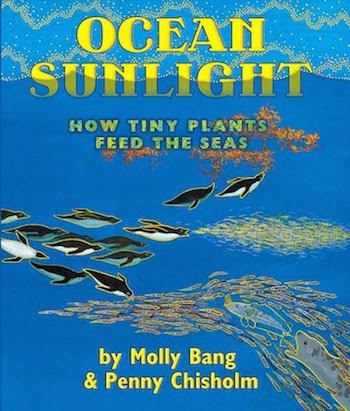 Partnering with MIT professor Penny Chisholm, the two wrote Living Sunlight: how plants bring the Earth to life and Ocean Sunlight: how tiny plants feed the seas. Living Sunlight is about how the sun gives us life through photosynthesis, the most important process on Earth and how that process connects all of life. Ocean Sunlight explains how phytoplankton, tiny sunlight-fueled plants feed all life in the seas. 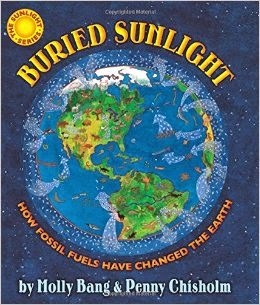 In Buried Sunlight: how fossil fuels have changed our world, Bang & Chisholm continue the series to explain how fossil fuels came to exist and how civilizations dependence on them has seriously altered our world. When we humans started using fossil fuels, we did not understand that our actions could influence the entire planet. Now we know that they can have a profound impact on our Earth and its biosphere. We must consider carefully the impact our choices have on our current world as well as on future generations. Bang & Chisholm do an excellent job simplifying the process of photosynthesis and its role in the cycle of life on Earth. When a world is in balance the exchange of CO2 and O is in balance. Yet our increased dependency on fossil fuels – coal, oil, and gas, has created a world out of balance; what scientists call Global Warming. Some people still ask, “So What?” Earth has changed a LOT over the billions of years since it was born! It’s been MUCH warmer, and MUCH colder, than it is today! Why NOT burn fossil fuels? The changes that are happening now are progressing too rapidly; many living creatures are unable to adjust to them. Bang calls for action when she asks, "What will happen to humans when there are no plants and water is scarce?" Bang's illustrations are colorful and fill every inch of the page. They mirror precisely what is being explained in the text. The best part of the book is the author notes. Six pages further explain what is being discussed in the book. To help children gain knowledge of basic scientific principals, all four titles in this series are highly recommended. 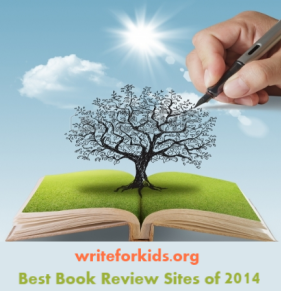 To see some of the illustrations, go here.